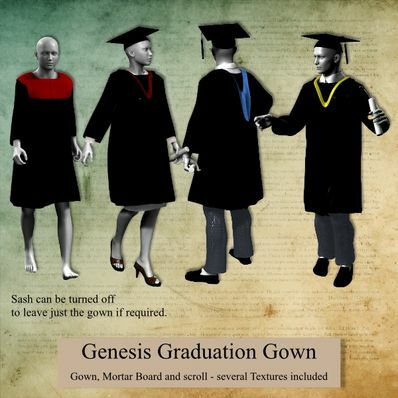 A Graduation Gowm, Mortar Board and Scroll for Genesis for use in Daz Studio 4. A Morph to lengthen the Graduation Gown so it can be used as for choirboys, priests, etc. Several textures included. Will work with most poses and shapes. Thank you thank you thank you for this! You don't know how long I've been looking for a loose, simple gown for my Zheien characters!!!! Now, if I can just get that twin-fingered hand rigged, I'll be churning out book covers again!!!! Thanks so much!!!!! You're the only source for this type of outfit. You sure you don't wanna charge? Can't believe we even get the scroll, thanks so much.